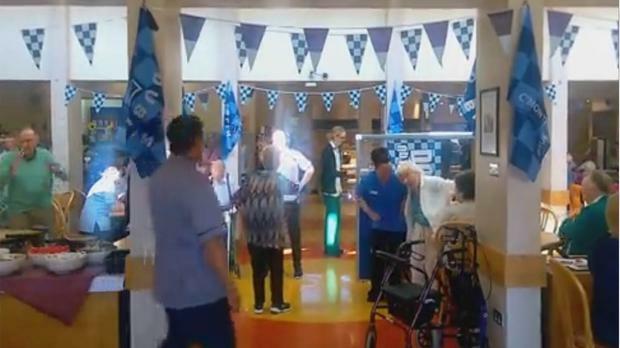 A group of 10 medical professionals and 24 patients from Our Lady's Hospice & Care Services in Harold's Cross surprised diners in the hospice's canteen with a flash mob on Thursday as part of Positive Aging Week last week. Each of the patients who took part are over 65 years old and had been practicing the macarena for one month before they showcased their dance moves. An employee of the hospice told Independent.ie that the patients love showing their family and grandchildren their dance moves at home, and that the classes are a really positive experience and are a way to celebrate life. Physiotherapists, occupational therapists and nurses were among the professionals in the hospice that took part in practicing the routine.